The fortifications were built by followers of William the Conqueror, as this allowed him to keep a tight rein of the land and its dwellers but following this King Henry called order that these were demolished due to the castle’s owner Gervaise de Paganel’s rebellion against Henry. In the year 1264 courts gave permission for the fortifications to be built once again and new owners took charge of the castle including the de Suttons, followed by John Dudley the Duke of Northumberland. Shortly after this John lost his life as he was executed when he attempted the make his own Daughter, Lady Jane Grey Queen. Queen Elizabeth l also spent time at the castle and at one point, it was thought this wold be the perfect place to imprison Mary Queen of Scots. Queen Mary gave the castle to the Sutton family, however but due to financial difficulties they did not keep the castle for a lengthy period and through marriage it was past to the Ward Family who remained at the castle right up until the Civil War period. In 1647 the castles fortifications were removed for the last time leaving the castle without, as it still now shows to this day. An animal zoo was built into the grounds of the castle during the 1930’s which many people still continue to visit to this day. 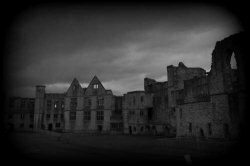 There are many ghosts and spirits that are said to haunt this old castle, the most famous reported is that of the Grey Lady who is thought to be the energy of Dorothy Beaumont, a former resident of the castle who died following child birth complications. Many visitors have reported sightings of her ghostly apparition in various areas of the castle’s grounds, along with the ghost of a drummer boy from the Civil War, often heard playing his drums near the gatehouse area of the castle.